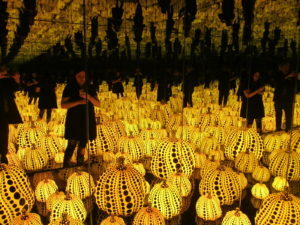 Time is running out to catch the Yayoi Kusama Infinity Mirrors exhibit at the Hirshhorn Museum in downtown DC. Advance timed passes have unfortunately all been given out, but a limited number of same-day walk-up passes are available in person through Saturday, May 14th, so we’d recommend getting an early start one day this week. Here is all the info you need. Our own agent Stu Burk and his daughter Delaney were fortunate enough to snag tickets to check out this really cool exhibit a few weeks ago. Infinity Mirrors is a tribute to the legendary Japanese artist Yayoi Kusama’s 65-year career and features 6 of her mesmerizing Infinity Mirror Rooms alongside several paintings that have never been showcased in the United States before. Stu and Delaney really enjoyed this exhibit and the rest of us have been trying each week to get tickets, but to no avail! After DC, the exhibit will move through Seattle, LA, Toronto and Cleveland. If you are passing through any of these areas, be sure to try and get tickets! This schedule will give you additional information on the dates. Were you able to see this exhibit? Let us know what you thought!